Boulder, CO (USA) -- Buddhist Geeks is a weekly web radio show that presents ground-breaking interviews and discussions with Buddhist teachers, scholars, and advanced practitioners. Combining ancient wisdom with modern technology, Buddhist Geeks aims to catalyze a community of practice committed to awakening. Based in Boulder, Colorado Buddhist geeks is hosted by Vince Horn, a Naropa University graduate and a longtime meditator despite his youthful 24 years of age. Also playing host is Ryan Oelke, a late twenties student of various Buddhist traditions and a graduate student and teacher at Naropa, one of the leading schools of Eastern studies in the United States. Together, these self proclaimed Buddhist Geeks aim to bring a fresh perspective to an ancient spirituality, and introduce it to a whole new audience of young people. Podcasting is a media delivery method that leverages the power of internet downloading with the portability of music players like the Apple iPod. 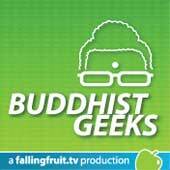 The Buddhist Geeks podcast can be easily downloaded through iTunes and played on your iPhone or iPod. Listeners can also enjoy Buddhist Geeks directly from the website with a handy web-based player. Check out Buddhist Geeks and discover the emerging face of Western Buddhism.